Conducted under the auspices of the American Social History Project/Center for Media and Learning, the CUNY Digital History Archive (CDHA) is an open, participatory digital public archive and portal that gives the CUNY community and the broader public online access to a range of archival materials related to the history of the City University of New York. The CDHA will conduct and collect oral history interviews as well as accept historical materials held by individuals whose lives, in diverse ways, have been shaped by CUNY. This early effort also involves coordination and collaboration with college libraries and archives that house significant historical records and collections. The project involves faculty, staff, students, archivists, librarians, retirees, and alumni and is supported by the Arthur P. Sloan Foundation. 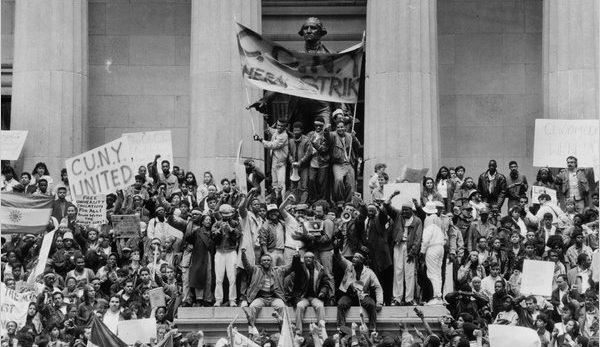 The history of the City University of New York (CUNY)—the nation’s first urban, tuition-free public institution of higher learning and its largest urban university system—offers scholars and the public a unique and especially useful lens through which to view and consider many enduring political, social and cultural questions in American society. The CDHA–which is both an archival repository of digital materials and a portal to already existing digital materials contained in archives across CUNY–aims to aggregate these stories, creating connections between events and sources on the individual campuses and allowing the complexity of the historical and educational issues to be fully understood. In addition to amassing, preserving and providing access to digitized historical materials and records, the CDHA understands its role as an active agent in providing historical and social context for the invaluable source materials contained in individual archival collections, thus making those materials more immediately accessible and useful for students, researchers, and the general public. We are committed to providing a contextual historical framework for each CDHA subject/era and collection. These short introductory essays will offer scholars and the public a useful historical framing through which to consider many enduring political, social, and cultural questions in American society, including unique insights and perspectives on urban life; ethnic, racial, religious and gender questions and conflicts; and political ideas and struggles.